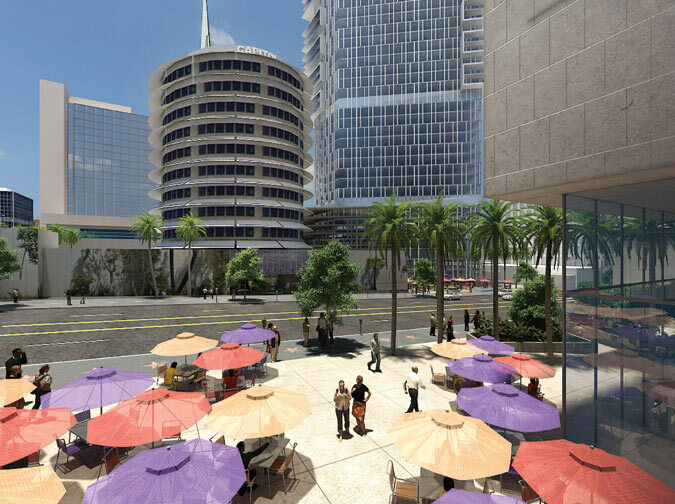 Millennium Hollywood, a mixed use development by Millennium Partners and Argent Ventures, is seeking to further revive downtown Hollywood and preserve the historic Capitol Records tower, designed by Welton Becket in 1956. According to architect Bill Roschen, who is also chair of the LA Planning Commission, and to spokesperson Brian Lewis, the approximately $1 billion project will include an outdoor public room, a pair of multi-level towers framing the Capitol building, and an off-the-freeway park from 4.47 acres of sunken in land and one million square feet of street level space. The architectural design has not been finalized. A bulk of the development will be located at the corner of Vine and Yucca, near the Hollywood/Vine Red Line Station, and will not obscure the landmark Capitol Records building, with its iconic form. The project does not currently have an end date, but the 2006 effort, part of a national urban development movement around public transportation, wants to use the area’s foot-traffic to rejuvenate the neighborhood.